95 percent work complete on the second unit, which will start in March or April, a senior Indian minister said. The first reactor of the Kudankulam Nuclear Power Plant (KNPP), which attained criticality in July, will generate power by the end of the month, V Narayanaswamy, minister of state in the Indian Prime Minister’s office said on the sidelines of a conference last week. “We will start production at the plant within 15-20 days as we have completed the trial run,” Narayanaswamy was quoted as saying in The Economic Times. The minister was cited by the paper as saying that the second unit will start by March or April and that 95 percent of the work is over on the unit. 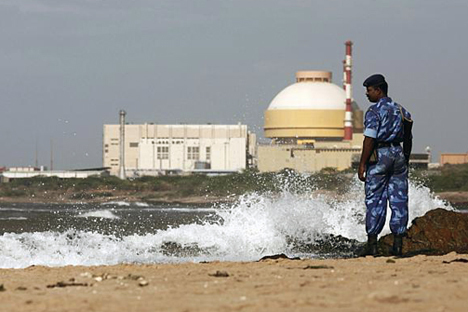 The Kudankulam units comprise of 1,000 MW reactors of the VVER-1000 model being constructed by the Nuclear Power Corporation of India Limited (NPCIL) and Russia’s Atomstroyexport company, a Rosatom subsidiary. The construction of the first two units of the power plant was halted in September 2011 over protests by local residents who demanded the scrapping of the Indo-Russian project citing the Fukushima nuclear disaster in Japan. Protesters had blocked all roads to the plant and would not allow the workers to enter. The work resumed in March 2012 and the first unit attained criticality on July 13, 2013. Leading Russian, India and international scientific experts have vouched for the safety of the project. The experts have maintained that superior technology and exceptionally high quality equipment used in the reactors at the project made them unique in the global nuclear industry.